Blueair air purifier was founded in Stockholm, Sweden in 1996. Former Electrolux executive Bengt Rittri had high expectations for his $2 million company. He believed in the old build-a-better-mousetrap theory, thinking a top quality product with exquisite design and breakthrough engineering would sell itself. In the webmastering and internet marketing community we have a saying, paraphrased from the Kevin Costner hit film "Field of Dreams." "If you build it, they won't come." “A good design leads to a clear increase in demand” says Blueair founder and President Rittri. But great engineering must fight even greater marketing for shelf space and web clicks. With Arizona ocean front for sale and free-gifts-just-for-trying-easy-credit-ripoffs holding major market share, Rittri was surprised when initial sales were slower than forecast. Underestimated manufacturing costs led to layoffs and outsourcing. To this day, he has kept the company lean, with many functions outsourced. This web site has a primary theme: beware of illusions. First, invisible particles and toxic gasses, beyond what cheap air purifiers can remove, are harmful to health. Of course you must remove sources first. But the second half of the site theme concerns broadcast media and internet marketing and marketing's relationship to product quality. In air purifier world, slick marketing often trumps quality engineering. Blueair is the perfect example of an engineering driven company that learned the hard way. He built a better air purifier, they didn't come. Advertising driven market share leaders, back then led by Sharper Image and Oreck, seldom make technical improvements. "A good ad campaign leads to brand awareness and a clear increase in demand." The going got tough, so the tough got going. Industrial designer Fredrik Magnusson was brought in to help Mr. Rittri develop the 501 air purifier. Blueair's commitment to technology leadership persists, which continues to develop new products. In 2009, Blueair revised its entire product line with new fans, motors, filters, and model numbers. The 402 is superseded by 403 and 450E. 501 by 503 and 550E. Blueair 601 is replaced by 603 and 650E. The current top of the Blueair line is the fully automated and very strong 650e. Marketing began on an upscale Tupperware party basis and evolved into a distributorship system with dealers in Europe, North America, Asia, and Australia. Focusing on high-end medical applications, the company adopted the slogan "Clean Air is a Human Right." High minded idealists may like this comparison, but I believe clean air is fast disappearing from the planet. Nobody can grant a "right" to clean air, it is something to be achieved and defended in our personal spaces. The Swedish headquarters handles product development, and marketing, while manufacturing is outsourced in Sweden (not China). The US corporate entity has headquarters in downtown Chicago. Contemporary styling earned Blueair the Excellent Swedish Design award. The original 501 air purifier graces a permanent exhibit at The Swedish National Museum. 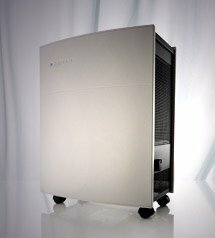 The unique filter system found in most Blueairs (203 is different) features an innovative blend of mechanical (HEPA-like) and electrostatic filtration, capturing 99.97% of particles at .1 micron. This is similar to the particulate removal performance of IQAir purifiers selling at higher prices. The ozone emissions of other electrostatic air cleaners and noisy high internal pressures of true-HEPA air purifiers are gone. Blueairs are perennial contenders in the Clean Air Delivery Rate race. Top Energy Star rankings and eco-friendly recyclable design round out the picture: a fine company dedicated to quality. The company's products are not perfect, please see individual model reviews for details and my suggestions for improvements. Before I developed Multiple Chemical Sensitivities (MCS), and needed an air cleaner just to function, I was a software engineer. Today I applaud quality companies which develop, innovate and improve health-promoting products.